Here in the UK, rice pudding has long been associated with nursery food (blame the Victorians, perhaps), school dinners or, at best, comfort food for the Winter. When slowly baked in the oven the milk reduces, the rice becomes thick and a brown skin forms on the top. The flavouring, apart from sugar, comes from a sprinkling of nutmeg and sometimes (rather unusually) a bay leaf. Safe, but unexciting – and to some people a complete turn off. Spanish rice pudding, however, is something entirely different and it would be so easy for the uninitiated to miss out on a treat. Spaniards appear to have a very sweet tooth and love their creamy desserts. The sweet vanilla custards crema catalana (a version of the French crème brûlée) and flan (similar to crème caramel) are both very popular, as is this very un-British rice pudding. Flavoured with vanilla, coconut, cinnamon, lemon and orange rind it is served chilled and is a popular sweetener at the end of the meal in restaurants and tapas bars. This is not a dish for a winter day (or the nursery) but ideal to finish off a summery meal. My family’s verdict was that this was really delicious so I shall certainly be making it again, especially as it was so easy. I would definitely serve it as part of a Spanish themed meal, possibly with some fresh fruit. Caramel oranges would be ideal and in keeping with the Spanish theme. A Spanish biscuit or small churro as an extra would be a good addition in place of some of the suggested serving toppings. My starting point for this recipe was a combination of two found online. 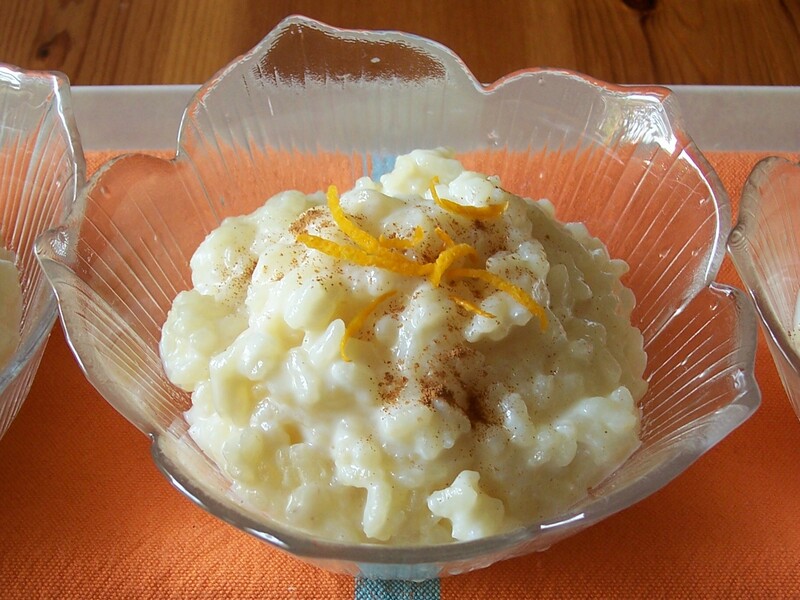 The first – my main source – was from The Times Online: Cinnamon Rice Pudding with a few ideas from the Canadian site Lululuathome, although I did not add either the egg or condensed milk suggested in this second recipe. The first time I used part milk and part coconut milk made from 25g dessicated coconut soaked in 250ml boiling water. A better alternative, which avoids having to discard the coconut, is to use all milk and add 1oz/25g coconut powder. Another alternative would be to use a can of coconut milk, which is available in a low fat version, topped up with milk. I took my quantities from the Times recipe, which is supposed to serve 4-6 but this would give very small portions: I prefer to think of it as for 3-4 people, even though it is rich. If it was cooked for slightly less time the portions would be larger but a little more runny. 1. Remove the zest from the fruit with a potato peeler, making sure no white pith is included. Put the milk, cinnamon stick and clove (if using) in a saucepan along with the lemon and orange zests. Bring to the boil then take off the heat and put to one side. 2. Leave for the flavours to infuse for 30 minutes. Strain and throw away the rinds and cinnamon stick. 3. Return the milk and heat through in the saucepan. Bring to a simmer and then add the rice. 4. Cook on a low to medium heat. Stir the rice and milk regularly for 10 minutes so it does not start to stick or burn. Add the sugar and vanilla extract. Continue to cook, stirring regularly for a further 10 minutes. 5. When the rice mixture has thickened and the grains are cooked (they should be soft when squeezed between a thumb and finger) remove from the heat. 6. Allow the rice mixture to cool and then chill in the fridge. 7. Serve chilled in small dishes dusted with cinnamon and a few strips of orange zest and/or dessicated coconut. Dumplings, as I have recently commented, are a traditional extra cooked as part of a warming stew and good served as an alternative to potato (or as well as if you really must). However plain dumplings, whilst being homely, are rather boring so various ingredients can be added to flavour, and improve, this useful little wintery filler. I recently posted a recipe with dumplings flavoured with caraway seeds and perfect for the traditional Hungarian dish of Goulash. 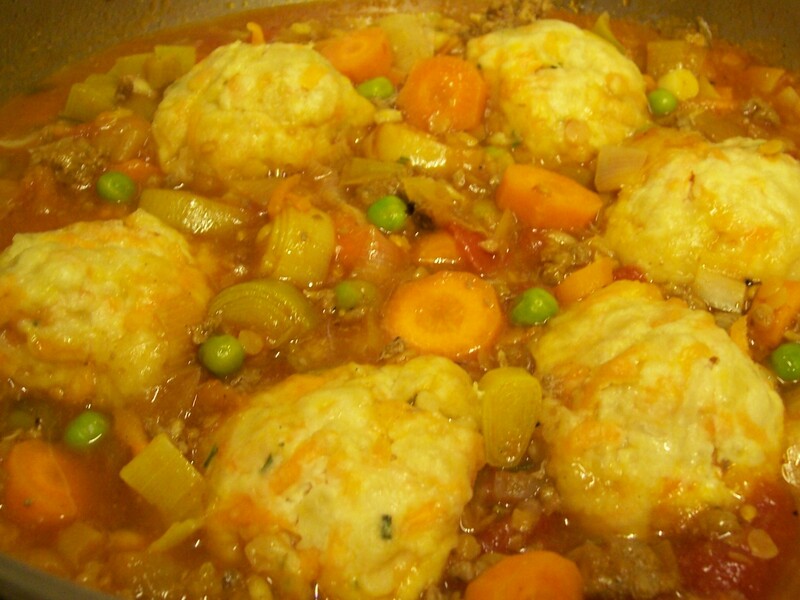 I have also already posted my own Beef & Bean Casserole recipe, served with plain dumplings. Last year I found a recipe at Mother May Have for carrot dumplings, which were served with stewed beef. In that case the dumplings did not contain suet, but nonetheless an idea was born. I successfully incorporated grated carrot into the basic suet dumpling mixture and on that occasion added fresh coriander, often used to complement carrot in soup though usually in its ground form. Grated carrot and suet dumplings make a good marriage, so it makes we wonder which other root vegetables would also be good – parsnip and beetroot are two experiments I intend to try. I have other thoughts as well: different herbs or spices, cheese, citrus zest ….! The minced lamb and lentil mixture here is one of our favourites. I have been making it for some years, initially inspired by an idea in The Complete Mince Cookbook by Bridget Jones (nothing to do with the diarist, I’m sure!) but so much adapted it has long since become my own work. The resulting stew is warm and comforting: as I have said before, I love the grainy quality of cooked red lentils and usually add pearl barley to the mixtured as well. There are always carrots and often some peas too. The quantities of the vegetables can, of course, be adjusted according to personal taste. In the past I have served the dish with rice or boiled potatoes but recently have replaced them with the carrot dumplings: a perfect winter meal in a bowl. 1. Gently fry the onion and garlic in the oil until softened. 2. Add the minced lamb and cook until the redness is gone. 3. Chop the plum tomatoes and add to the pan with the leek, carrot, pearl barley and lentils plus the chopped rosemary and the water. Bring the the boil, then reduce the heat and simmer until the barley and lentils have started to soften. Season to taste with salt and black pepper. 4. Meanwhile mix together the dumplings using the basic recipe. Grate the carrot and add about 2ozs to the mixture with the chopped rosemary (alternatively fresh coriander or other herb). Any extra carrot can be stirred into the panful of stew. Divide into enough balls for 2-3 per diner. 5. Add the peas and then the dumplings to the pan. Make sure there is enough liquid in the pan as the dumplings will steam so add more water if needed. Bring to the boil and then turn down to simmer and cover with a lid. Cook for 10-15 minutes more depending on size of dumplings. 6. Check seasoning and serve in bowls. Can be served with potatoes, or chunks of potato can be cooked into the stew (added at the same time as the carrot, or later if cut into small dice). The recipe comes from the website Allrecipes.co.uk, which is a good source of ideas. The original was called Lemon Barley Pilaf with Chicken. This is my version which uses Turkey and Bacon. It can be made with either fresh or pre-cooked turkey (I have given instructions for both) adding the bacon for extra flavour. (Chicken can be used if you prefer.) A smaller quantity of leftover meat will be needed than fresh meat and, of course, ready cooked meat is added towards the end of the cooking time as it just needs reheating. I ‘tweaked’ a few of the other ingredients a little and also used baby Spinach in place of rocket. The instructions for cooking the pearl barley did not seem to give it long enough, so in line with another recipe I make regularly (Pot Roasted Vegetables and Pearl Barley) I pre-cooked the barley for a short while (about 15 minutes) before adding it to the remaining ingredients. This recipe got the thumbs up from my family, particularly because of its delicious fresh lemony flavour, so I shall definitely be making it again. I think it could equally well be made as a conventional risotto using arborio or a similar risotto rice. 1. Place the barley and stock in a saucepan. Bring to the boil, reduce heat and simmer for 15-20 minutes, until partially but not completely cooked. Check liquid level reguarly to make sure it does dry out, adding a little extra water if needed. 2. Put the oil in a heavy saucepan and heat over a medium heat. Stir in the onion and if using fresh meat add the diced fresh turkey or chicken and bacon (cooked meats are added later) and cook until it starts to change colour. Add the carrot, celery and garlic and stir into the mixture. Cook gently for about 1o minutes, stirring occasionally, until the vegetables soften but without browning. 3. Stir in the cooked barley along with its cooking stock and bring back to the boil. Stir in the thyme and lemon zest. Turn the heat to as low as possible, cover and simmer for about 10 minutes more, stirring occasionally until the barley is almost soft. 4. Add peas and stir well. Cover the pan and simmer for a further 4–5 minutes.The barley should be soft and the liquid should disappear but be careful the mixture does not stick so check and stir regularly. Add the lemon juice. If needed, a little more boiling water can be added. Season to taste. 5. If using leftover ready cooked meat then dice it well and add to the pan. Add the baby spinach leaves, lightly stir through the mixture and cook for no more than 1minute so it is just wilted. 6. Serve immediately in a bowl with a scattering of grated parmesan (optional). Unflavoured, couscous is really unexciting. However, flavoured with oils, lemon and herbs or spices it can be transformed into a delicious accompaniment not just for North African dishes, but as a side dish for simply grilled meat or as part of a cold or warm buffet. This is my variation on a recipe from the book Sarah Brown’s Vegetarian Cookbook. I have several books by this well known vegetarian writer who introduced a BBC vegetarian cookery series in the 1980’s. 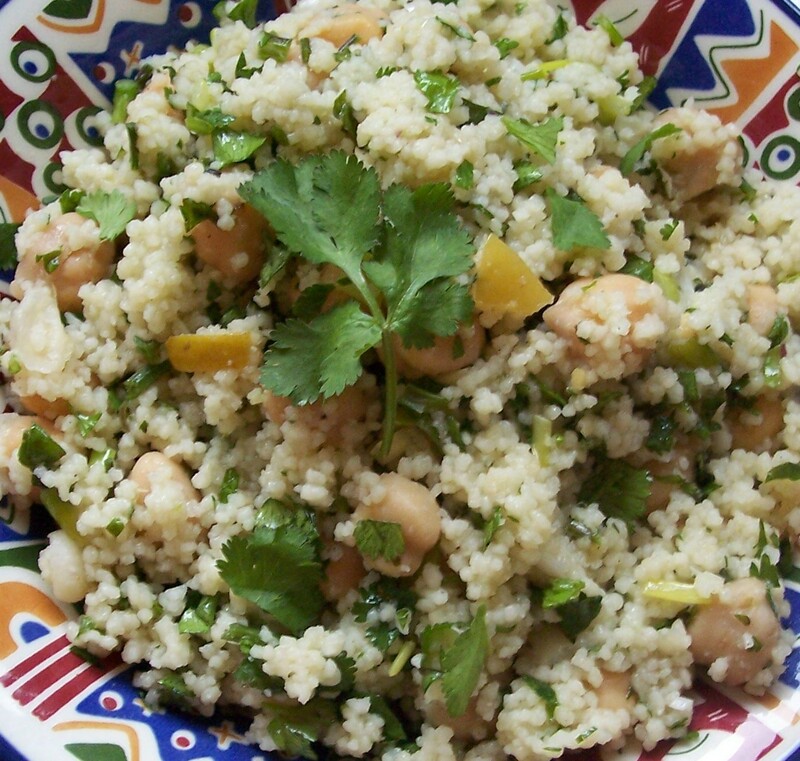 (See my version of the original recipe: Chickpea & Couscous Salad.) I have changed or substituted some of the ingredients for this version: the original included 1tsp miso (shoyu or soy sauce could be substituted) and 1tsp lemon juice, which I have changed to preserved/Pickled Lemon – also lots (and lots) of chopped fresh Coriander (and it must be fresh). This is a simple unspicy dish, but would be good with a sprinkling of Sumac, a commonly used eastern spice (see recipe for Grilled Chicken with Sumac & Roasted Banana) or, for a hotter taste, add ½-1tsp Ras el-Hanout or Harissa paste at the same time as the oils. Cooked couscous keeps for several days in the fridge and may be frozen for up to three months and should be thoroughly defrosted before it is eaten. If it has coriander added the flavour could be affected when defrosted. 1. Place the couscous, drained chick peas, oils, garlic, spring onion and chopped lemon or lemon juice in a large heatproof bowl or jug. 2. Pour over the boiling water and mix together with a fork. The couscous will absorb the liquids quite quickly. 3. Add the fresh coriander, reserving a little as a garnish if you wish, and season. 4. If it is to be eaten hot, this salad should be made just before it is served as it cools quickly. (If necessary, it can be briefly reheated in a microwave, but may need a little more water if this is done although it is best not made too far in advance.) Alternatively it can be left to cool and is ideal served cold, perhaps as part of a buffet. 5. Sprinkle with reserved coriander, or a few individual leaves and a little sumac powder (optional) or ground black pepper. Here is my version of the original recipe by Sarah Brown. Good hot or cold. Having bought several marrows as they were very reasonably priced on the market, I searched through my books and on the web for some tasty ideas. This one caught my attention, especially as it used both couscous, which is lovely as a vegetable stuffing and spicy chorizo sausage. You could add some bacon to the couscous stuffing and top with some melted cheese, either grated or a thin slice. The mixture could be used to stuff peppers (although you might like to leave out or use a different colour pepper in the filling mixture). A small portion of this stuffed in a marrow ring or half a courgette would make a good starter. This was based on an original recipe created by chef Antony Worrall Thompson on the BBC Food website. It was originally paired with a recipe for Rosemary Roasted Marrow. I am not sure I would want to eat marrow cooked in two different ways at the same meal, but I’d be happy to eat them separately. Certainly this first recipe is tasty so I plan to try the other recipe soon. It sounds as if it could be a good accompaniment for lamb. 1. Preheat an oven to 200oC/390oF/Gas 6. 2. Slice the marrow in half lengthways, scoop out all the seeds and place on a roasting tray. 3. 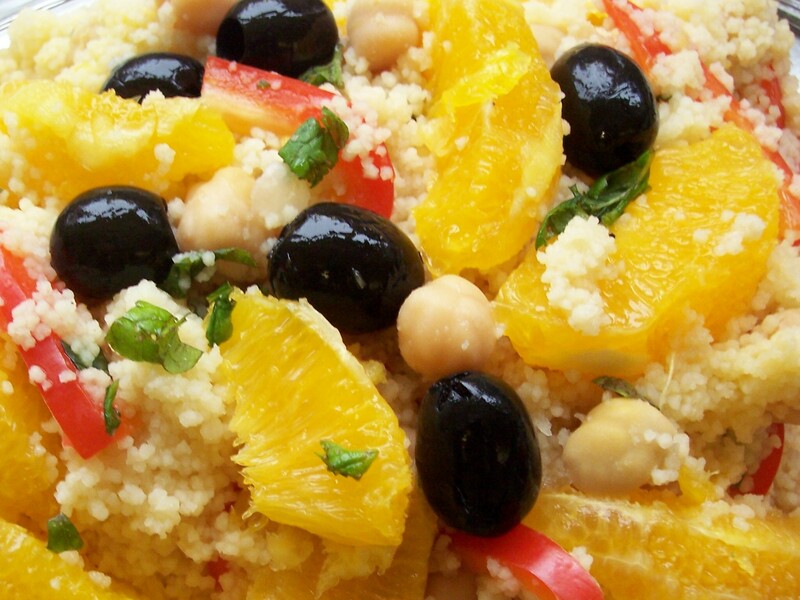 Place the couscous in a bowl with the lemon juice and enough boiling water to cover. Allow to soak for five minutes. 4. Heat the olive oil to a frying pan. Gently fry the red onion and chorizo for 5 minutes until the onion is just softened and the chorizo is just crisped and the juices released. Add to the couscous and then stir in the pepper, tomatoes and herbs. 5. Mix well and season to taste with salt and black pepper. Spoon into the centre of the marrow pieces. 6. Pour a little water into the tray around the marrow pieces, but keep well below the level of the filling, place in the oven for 20 minutes. Cook until piping hot and the marrow is just tender. 7. Season with a little salt and black pepper. Serve with a small side salad. This is a good meal for anyone who does not eat much meat, but for additional meat it could also be served with rashers of bacon. This is one of my favourite ingredient combinations for couscous. It makes a good accompaniment for meat at a main meal but it could equally well be served as a light vegetarian lunch. It is best when dressed with the oils and lemon while warm to allow the flavours to develop and is lovely served slightly warm as well, although there is no reason why it could not be served cold at a buffet or picnic. The original recipe comes from Sarah Brown’s Vegetarian Cookbook, a paperback first published in 1984. If you want a more substantial dish then use two tins of chickpeas or double the quantity of uncooked peas below. I also sometimes make it without the chickpeas, or substitute another bean. The original recipe called for 12-15 spring onions, which seemed rather a lot, so I reduced the amount by more than half. I also substituted soy sauce for the miso, as I did not have any in my cupboard and used some of my stock of coriander leaves from the freezer, so did not have any fresh leaves available for garnish. Increase the lemon juice if you want it more zesty, in fact you could also use more zest stirring it through the couscous in the initial cooking stage as well as keeping some for a garnish. An even simpler microwave oven method of making this dish is the ‘throw it all in together’ method. Combine all ingredients except the chick peas, seasoning and garnish. Microwave until the liquids are absorbed. Stir through the peas, season, garnish and serve – easy (chick)peas-y! 1. If you are using uncooked chickpeas, put them in a large pan and cover with plenty of fresh water but no salt. Boil hard for 10 minutes. Reduce the heat and skim off any scum that has collected. Cover and simmer until soft (50 – 60 minutes). Set aside. 2. If you are using a tin of chickpeas gently heat through (in either microwave or a saucepan). 3. Place the couscous in a large heavy based pan with crushed garlic, spring onions, coriander and olive oil. Mix miso or soy sauce with the boiling water and pour over the couscous. Bring to boil and then simmer, stirring occasionally, for about 5 minutes or until the water is absorbed. 4. Drain the warm chickpeas well and add to the couscous mixture with the sesame oil, lemon juice and seasoning to taste. Fork over well. Garnish with lemon zest and coriander leaves. 5. Serve warm as a light main or side dish or cold at a buffet or picnic. Adapted from a recipe cut from our local newspaper, the Waltham Forest Guardian and a very quick and simple supper dish, once the oven is up to temperature. The original was a Waitrose recipe which I have since found on their website. The original recipe suggested a vegetarian alternative, replacing the meat with butternut squashor sweet potato (and vegetable stock in place of chicken) but I added the sweet potato anyway. On the first occasion I made this recipe, I went to cut the parsley only to find the slugs had visited it first, so I improvised with some frozen peas for colour. These extra ingredients both worked well in the dish so I have included them in my version below. The background flavour of the lemon juice and zest was lovely with the other ingredients, especially the spicy Harissa Paste. (I bought my Harissa Paste ready mixed in an inexpensive handy tube at Akdeniz our excellent local Turkish supermarket, but here is a Harissa paste recipe showing the ingredients.) Without the addition of the sweet potato and peas, Waitrose suggested that a simple watercress or rocket salad would be a good accompaniment. Recently I have added some diced Pickled Lemon or Lemon & Lime, which is very simple to make, which gives a lovely lemony tang to the dish. Vegetarian Variation: Use vegetable stock in place of chicken and replace the meat with butternut squash (as suggested in the original recipe), mushroom, tofu or stir toasted nuts into the mixture just before serving. 1. Preheat oven to 200oC. 3. Chop the chicken/turkey, sweet potato, tomato, aiming for similar sized pieces, weight out the peas (if using), open and rinse the chick peas. 4. Toss in the meat, sweet potato and peas into the pan with the onion. Season as required and place in oven, covered, for a further 10 minutes. 5. Dissolve stock cube in 1 pint/550ml water and add lemon juice. 6. Stir couscous into roasting tin with chick peas, lemon zest, stock/water/lemon mixture. 7. Return tin to the oven for 5-10 more minutes until the stock has been absorbed making sure the chicken is thoroughly cooked with no pink meat. The tin should be covered to help steam the couscous through. Take the tin out of the oven and lightly fork the mixture through before cooking uncovered for the last 5-10 minutes. If you are using pre-cooked peas they can be added at this point to allow them to warm through. 8. Stir through the parsley, once more using a fork to lightly separate the couscous saving a little parsley as a garnish. 9. Serve in bowls (with salad, as suggested above, if required). This homely vegetarian dish is best served in a bowl with chunky crusty bread on the site. I first served this to my family as they came home on a very snowy night and it was perfect to drive away the winter chill. It has become a regular winter favourite. The recipe comes from the pages of an old magazine but I am not sure which one, plus I have adapted it slightly. The original food writer was Amanda Grant. (To find out if I have added more recipes by this writer enter her name as a Search in the panel on the right hand side of this page.) The original recipe was designed to bake in the oven, but I find that it just as easy to cook it slowly on the stove top. Note: Cut vegetables into similarly sized pieces to cook evenly. 2. 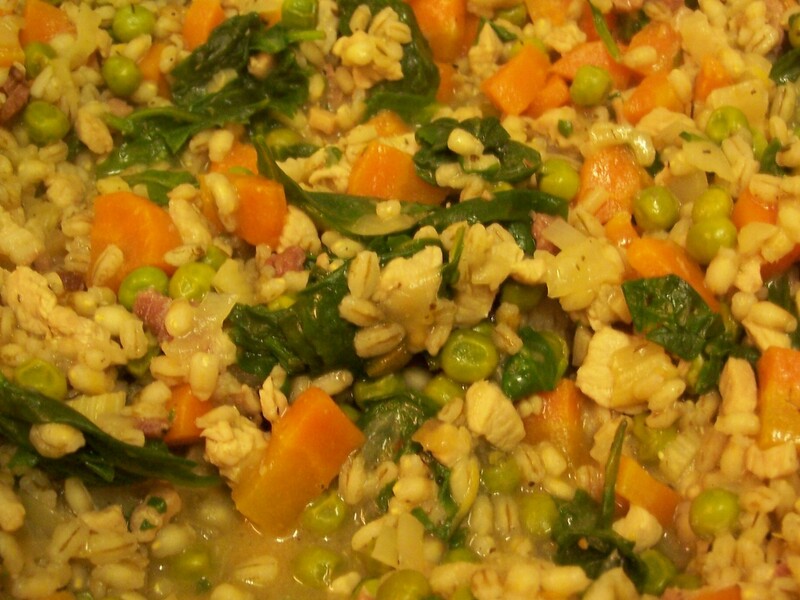 Put pearl barley in a pan of water and bring to the boil, reduce heat and simmer for 30mins, drain and set aside. 3. Heat 1tbsp olive oil in a pan. Saute the vegetables in batches, transferring to a deep ovenproof dish when browned and using a little more oil as required. 4. Sprinkle over the soft brown sugar and stir over a gentle heat until slightly caramelised. 5. Add the stock, a large pinch of sea salt, the bay leaf, thyme (plus lemon if using) and cooked pearl barley and bring to the boil. 6. For the quick version: Turn down the heat, cover and simmer slowly until the vegetables are cooked though. Remove lid towards the end if necessary to reduce sauce. For the oven cooked version: Remove from the heat, transfer to the oven for 40mins until the vegetables are cooked and golden.